and was designated a National Important Intangible Folk Cultural Property in 1980. 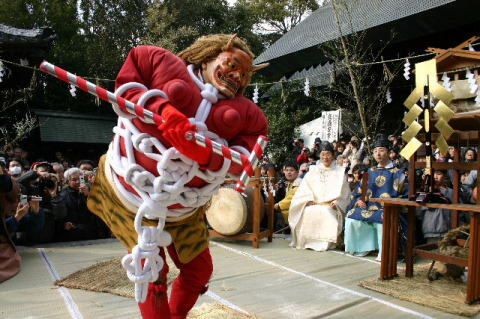 On the festival eve (Feb.10), it's started with Iwato-no-mai dance. The heros and heroines of this day are boys and girls. rivalry between Aka-oni (Red Demon) and Tengu (long-nosed goblin)". The story performed by the red demon and Tengu has come from Japanese mythology. A god of martial arts (Sarutahiko-no-mikoto = Tengu) fought to chasten and straighten him out. Then all the gods felt happy and danced kagura. and to pray for a rich harvest and prosperity. Red Demon repeatedly provokes battle with Tengu, but is defeated. 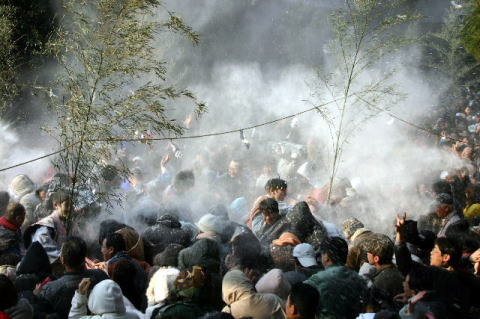 scattering tankiri-ame (candies made from grain powders) and white grain powder over the visitors to drive out the evil. 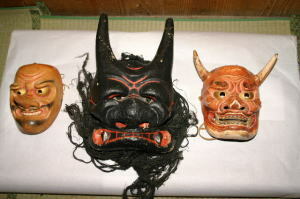 Kuro-oni (Black Devil = Ame-no-koyame-no-mikoto of the mythology) fills the role of judge. It is said that if you are showered with this powder or eat tankiri-ame, you will not get ill during the summer. Lots of visitors are excited to get tankiri-ame and a powder shower. Please confirm with each organiser before making your arrangements. 8:30- *Ao-oni (blue demon) is lustrated. 10:00- *Iwato-no-mai (dance) by boys and girls. Ao-oni (blue demon) also join the dance. 16:00- *Iwato-dance members and Ao-oni (blue demon) visits Dango-gu Shrine with Shinto priests. 18:00- *Ao-oni (blue demon) returns to the Akumi-Shinmeish Shrine. *Kuro-oni (black demon) comes to the shrine. 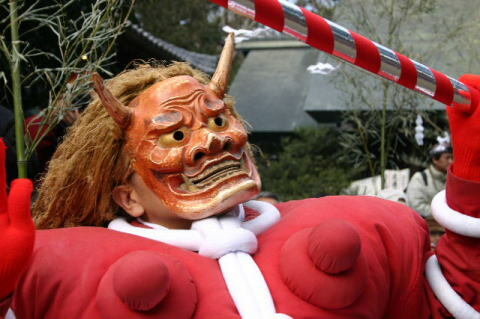 14:00- *"Rivalry between Aka-oni (red demon) and Tengu"/ "Aka-oni to Tengu no Karakai"
16:00- *The enshrined god moved to Dango-gu Shrine temmporaly. 16:10- *Drumming performance in front of the main shrine. 17:30- *The enshrined god comes back home shrine. 19:00 *Demonlet comes back to the Akumi-Shinmeish Shrine. 22:00 *Red Demon and Tengu comes back to the Akumi-Shinmeish Shrine. and hold an openin ceremony. wearing costumes The costume of Red Demon weights more than 20kg..
Keman The white rope decoration on the demon is called keman. or JR Nagoya Honsen line. Get off at Toyohashi-Koen-mae sta..